Erosion marks are a natural consequence of water moving against a surface over a period of time. For example, consider how a stream begins as a trickle of water down a mountainside. Gradually, the water wears away the surface and eventually you’ve got a river—and in an extreme case, The Grand Canyon. Your pool isn’t facing this level of erosion, of course. But the same friction of water-against-surface can result in worn spots that eventually become visible. Also, you might feel these spots while swimming. The proper chemical balance is important for preventing erosion, because water by itself is actually quite aggressive. It tries to dissolve a surface—unless we prevent that by adding sufficient levels of calcium, which helps protect surfaces including plaster, concrete and tile grout. The bottom line, if your pool surface has erosion marks, it’s time to think about resurfacing. Do you have pool stains that just won’t brush out, no matter how hard you try to clean them? Unremovable stains really age a pool, making it look unappealing even when it is clean. Stains can be caused by an excess in certain chemicals, or if there are metals in the water (from an old pool heater). Stains occur if natural debris (leaves) are not cleared away from the pool bottom; and algae can also create stains that don’t always clean off. Also, if you or a pool service provider is not properly servicing the pool and ensuring the right chemical balance, the result can be stains on the pool surface that never go away. Do you feel rough spots on the pool floor? These areas can even scuff your feet—a sure sign that the pool needs resurfacing. Rough spots occur over time when the pool surface wears down. They can occur because of a chemical imbalance (pH levels), unexpected damage, or if the pool surface was not properly installed in the first place. We often run into pool surface issues that are the result of poor craftsmanship during the pool building process. Rough areas should be addressed for the safety of swimmers, the integrity of the pool surface—one spot leads to another—and the overall appearance of the pool. 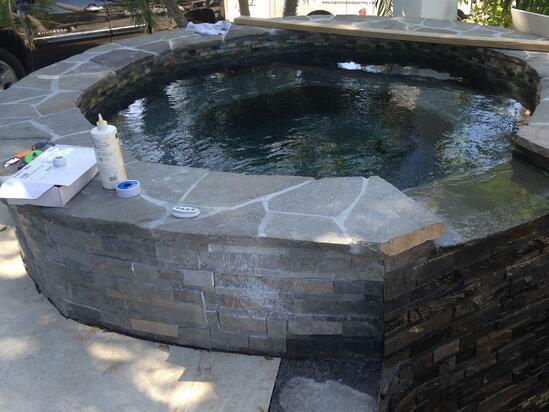 Tile pool surfaces stand the test of time, lasting up to three times the live of a typical plaster pool surface. That said, the grout can show signs of aging and eventually can corrode if it is not cared for properly. Sometimes, pool tile loses its adhesive property and can “pop” off the pool floor. This is generally the result of poor installation—and unfortunately, you won’t realize that pool tile was not put in correctly until years later when it fails. Ruptured tiles can cut swimmers, and it’s definitely not an appealing look. The fact is, we can explain why the water level is dropping—even if the disappearing water seems like a mystery. Leaks are not always easy to detect. Cracks in the pool surface usually occur because of poor pool construction. Again, this goes back to hiring a pool professional that understands what is required to design and install a quality, long-lasting pool. 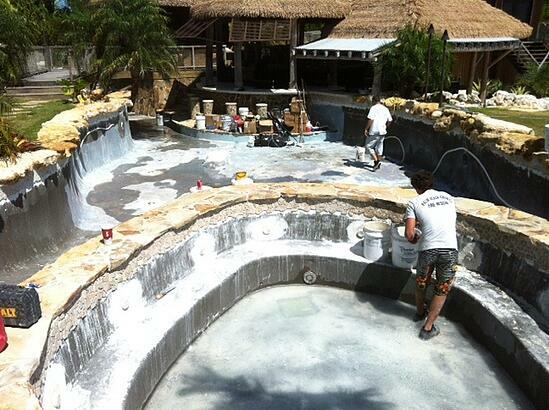 The certified pool service team at Reef Tropical can assess your pool and provide recommendations for resurfacing. Diamond Brite is a blend of colored quartz aggregates and polymer-modified Portland cement. Glass tiles are the most elegant and come in a range of colors and designs. You can even order custom-color tiles. Pebbles are aggregate finishes like PebbleTec, PebbleSheen and Hydrazzo. We almost always recommend resurfacing a pool vs. attempting to use acid washes to lift out stains—or chipping out rough patches and replacing the surface. These fixes end up looking like band-aids and do little to preserve the longevity of your pool surface, improve its aesthetic quality or increase the value. Give your pool a facelift with today’s modern pool surfacing techniques that produce long-lasting, visually stunning results. See Reef Tropical in action on our YouTube channel—and give us a call for a consultation. Contact us at 305-367-2005, or fill out this simple contact form to request a proposal.